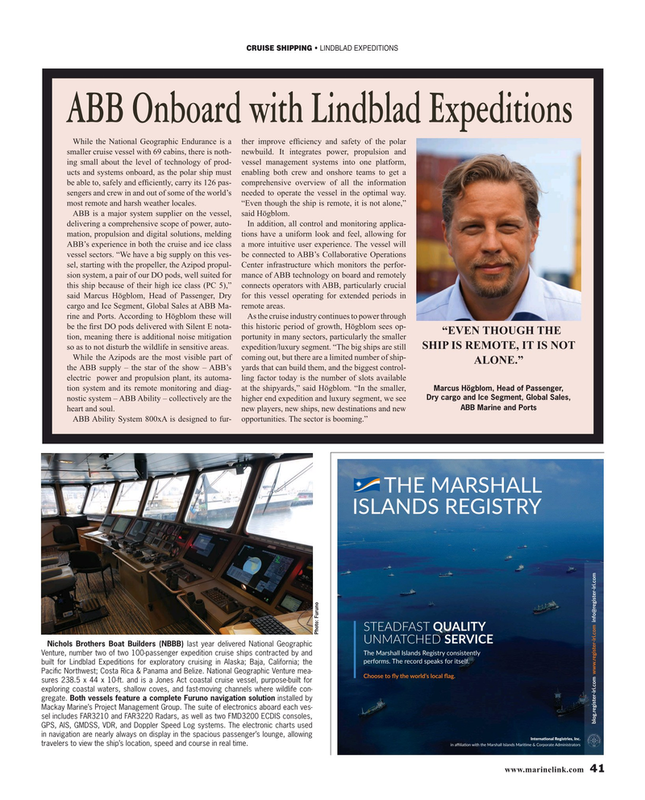 ABB is a major system supplier on the vessel, said Högblom. ABB’s experience in both the cruise and ice class a more intuitive user experience. The vessel will vessel sectors. “We have a big supply on this ves- be connected to ABB’s Collaborative Operations sel, starting with the propeller, the Azipod propul- Center infrastructure which monitors the perfor- sion system, a pair of our DO pods, well suited for mance of ABB technology on board and remotely this ship because of their high ice class (PC 5),” connects operators with ABB, particularly crucial said Marcus Högblom, Head of Passenger, Dry for this vessel operating for extended periods in cargo and Ice Segment, Global Sales at ABB Ma- remote areas. Nichols Brothers Boat Builders (NBBB) last year delivered National Geographic $_;-uv_-??v?-m7v!;]bv|u?1omvbv|;m|?? GPS, AIS, GMDSS, VDR, and Doppler Speed Log systems. The electronic charts used in navigation are nearly always on display in the spacious passenger’s lounge, allowing m|;um-?om-?! ;]bv|ub;vkm1l travelers to view the ship’s location, speed and course in real time.